MONMOUTH -- A project to renovate the Monmouth Grange Hall got a $400,000 boost recently to help turn it into a showpiece for community events, a well equipped emergency shelter, and space for The Theater at Monmouth. GrowSmart Maine announced last week the Grange was one of 11 projects to get Maine Department of Economic and Community Development grants for downtown revitalization projects. The department received 32 applications seeking $8.6 million, according to GrowSmart Maine, which is headed by Nancy Smith, of Monmouth. The $400,000 for the Monmouth Grange project depends on voters agreeing to accept the money, which comes without local costs. Voters will see that as one of five local questions on the Nov. 8 ballot. A public hearing is set for 6 p.m. Wednesday, during a selectmen’s meeting. Town Manager Curtis Lunt said the $400,000 is on top of a $450,000 federal grant received last year to rehabilitate the structure. The town had to apply for the grant, but did not have to put out any money for that one, either. “It’s right in our downtown — a prominent, historical, rare building,” Lunt said. The building has since been moved off its foundation and moved back onto a new one. The property is owned by The Theater at Monmouth and The Shakespearean Theater of Maine, a nonprofit corporation. David Greenham, who most recently stepped down as the group’s producing director, is overseeing the project. “The Grange building is a really important building for the town of Monmouth,” Greenham said. “It’s not on the Historic Register, but it’s a building where people gathered for years beginning from about 1860 to 1870. Greenham said the $400,000 is matched by the previous $465,000 federal grant as well as a special projects grant, a nonprofit grant, a USDA Rural Development grant and aid from the Davis Family Foundation. 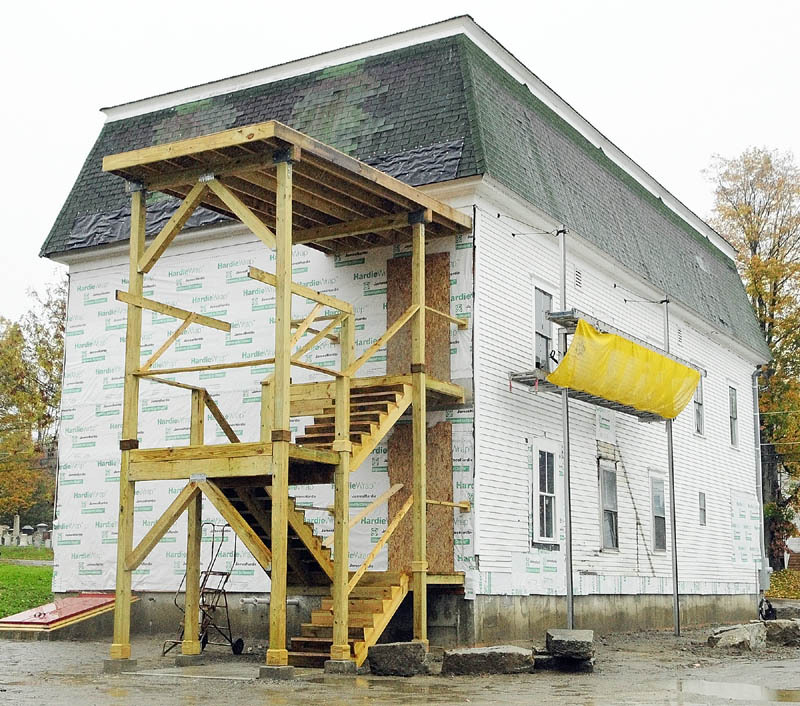 “This will allow the building to be completely finished so that it includes an elevator, new roof, new siding throughout, more insulation than we originally planned and new windows throughout,” Greenham said. The town also will have a well-equipped emergency shelter that shares a large generator with the Monmouth Fire Station next door. Greenham said there might be another, smaller fundraising push to try to get the kitchen properly fitted to prepare meals in emergencies. “There is nothing local between Augusta and Lewiston that could put out the number of meals that would be needed to be put out,” Greenham said. He recalled that during the ice storm of 1998, Main Street had power restored a lot sooner than many of the more rural areas of town. GrowSmart Maine is one of the groups that worked in a coalition for the passage of bonds in 2009 that would fund the improvements downtown. The Grange building was purchased by the theater in 1990 when the Monmouth Grange merged with Winthrop Grange, said Smith, a farmer and former Democratic legislator. “As a resident of Monmouth, I think it’s exciting to have this building brought back to life to become a year-round part of the community,” Smith said. Greenham said the building would be available for use by the community for a variety of events for a nominal fee to cover costs, which should be low because of the improved energy efficiency. Winthrop also received a grant, which is being used toward a new slate roof for the C.M. Bailey Public Library. Other communities that received awards are Bath, Belfast, Dover-Foxcroft, Eastport, Livermore Falls, Norway, Rockland, Skowhegan and Unity.